Today it is different. The steady war of propaganda avalanches loosed by press, radio and film makes it impossible for the thought to hear itself. It wavers, weakens and ends up in resignation. And the worst of it is that the evil is not confined to the "totalitarian" parts of Europe, but that it is spreading and infecting the intellectual life of all nations with a strange anarchy mixed of doubt, discontent and confusion. That extract is from a lecture given in Paris by the the Czech writer Franz Werfel in 1937. The evil that Werfel spoke of forced him, together with his wife Alma - seen above - to flee Vienna a year later and follow an arduous path to freedom in California. 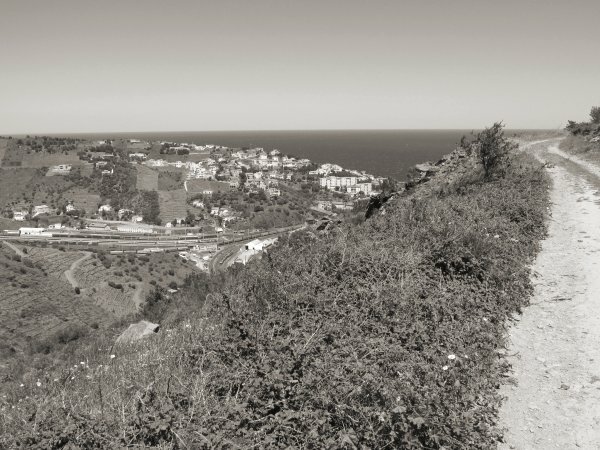 For part of their journey they had to walk - with Alma carrying the autograph score of a Bruckner symphony - along the torturous path seen below. The path is in the region of south-west France where the hills known as the Albères reach the Mediterranean. These hills are the eastern extension of the Pyrenees which form the border between France and Spain. 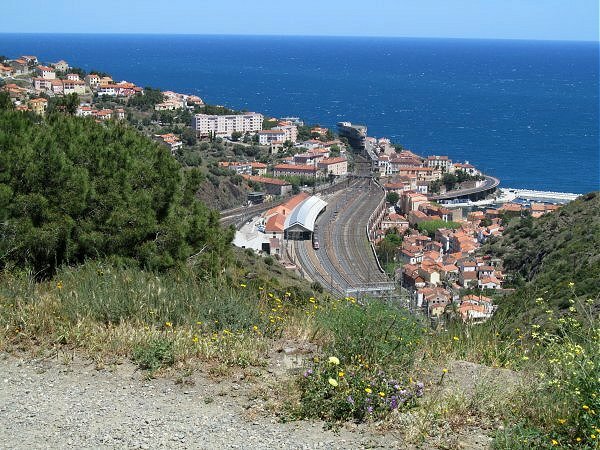 This rough track connecting the coastal towns of Cerbère in France - visible in the distance - and Portbou in Spain was a favoured escape route for refugees in the early years of the Second World War, and today's overgrown path literally walks the walk with Alma Mahler along it. 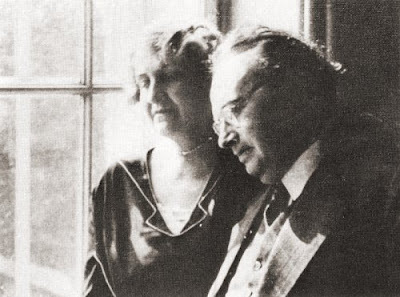 Alma Mahler, famously described by Tom Lehrer as 'the loveliest girl in Vienna', had married her third husband Franz Werfel in 1929 after a long affair; they are seen above around the time of their wedding. She had been married to Gustav Mahler from 1902 until the composer's death. Alma then married the architect Walter Gropius in 1915 and divorced him five years later. 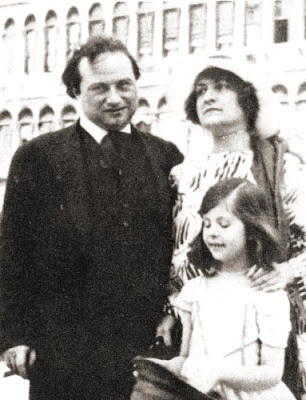 The photo below was taken in Venice in 1920 and shows Alma Mahler and Franz Werfel with Alma's daughter by Walter Gropius, Manon - it was the death of Manon in 1935 that inspired Alban Berg's Violin Concerto. Franz Werfel was Jewish and he and Alma escaped from Austria to France after the Anschluss in 1938. When France surrendered to the Nazis in June 1940 the Werfels were in Paris and joined the exodus south into the unoccupied zone. In Marseille they were given American visas; but were unable to obtain French exit permits as they had been stripped of their nationalities by the Third Reich and did not have passports. They then made several unsuccessful attempts to escape from France, one of which took them to the Catholic pilgrimage centre of Lourdes. There Alma, who had been raised a Catholic, collected pamphlets and religious tracts telling the story of Bernadette Soubirous and the Marian visions. When Franz read the tracts he vowed that if they escaped to freedom he would write a tribute to the girl who became Saint Bernadette. After they returned to Marseille the Werfels' escape was finally masterminded in July 1940 by Varian Fry. He was an American journalist and humanitarian who ran a privately funded rescue network that helped thousands of Jewish refugees and other fugitives to escape from Vichy France over the Pyrenees into Spain. Varian Fry deserves his own post: while at Harvard he published an influential literary magazine with New York Ballet founder Lincoln Kirstein, he interviewed Harvard alumnae and Nazi court composer Ernst Hanfstaengl in 1935, was one of the first to reveal the planned extermination of the Jews, and masterminded the escape from Vichy France of prominent figures including Marc Chagall, Max Ernst, Wanda Landowska and André Breton. His role in saving key European intellectuals is being celebrated as part of the Marseille European Capital of Culture 2013 activities with the exhibition 'Varian Fry in Marseille: the culture of Europe in exile'. The escape group led by Fry in July 1940 comprised Thomas Mann's son Golo, and Mann's' brother Heinrich with his wife Nelly, as well as the Werfels. Alma and Franz are seen below in the Austrian Alps. Alma's baggage filled twelve trunks and included several Mahler manuscripts, among them Das Lied von der Erde. 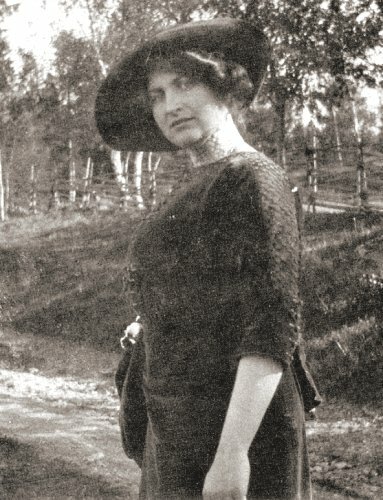 In her diary Alma describes how "I was wearing sandals, and lugged along a bag containing the rest of the money and jewellery and the score of Bruckner's Third Symphony." In fact the score comprised only the first three movements of the symphony. When Bruckner died the autograph score of the Third Symphony was donated to the Hofbibliothek in Vienna, but was found to comprise just the Finale. This was because the composer had given the other movements to Gustav Mahler, either to make a two-piano transcription or as a reward for having made the reduction. Alma discovered the score among Mahler's papers after his death and it became one of her most treasured possessions. 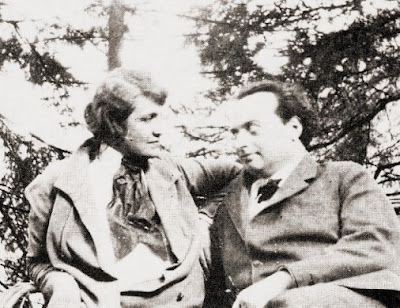 After Alma married Franz Werfel the manuscript was displayed in their house in Vienna where it came to the attention of Hitler. The Führer, who was an ardent Brucknerian, offered to buy it. But the manuscript was smuggled out of Vienna after the Werfels fled, and was reunited with Alma in Paris. That is Alma below walking in the countryside in happier times. Led by Varian Fry, Alma, together with her priceless baggage and companions, travelled by train from Marseille via Perpignan (where Pablo Casals held his first Casals Festival ten years later) to Cerbère; but they could not cross the border by train as they did not have exit visas. 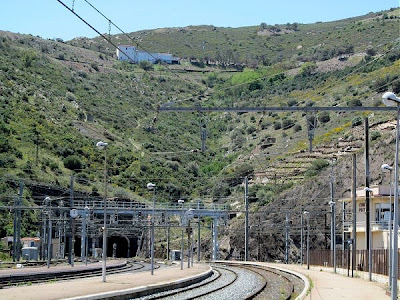 After spending the night in Cerbère, Varian Fry, who as an American citizen did have an exit visa, continued on the train with Alma's twelve trunks to Portbou in Spain. 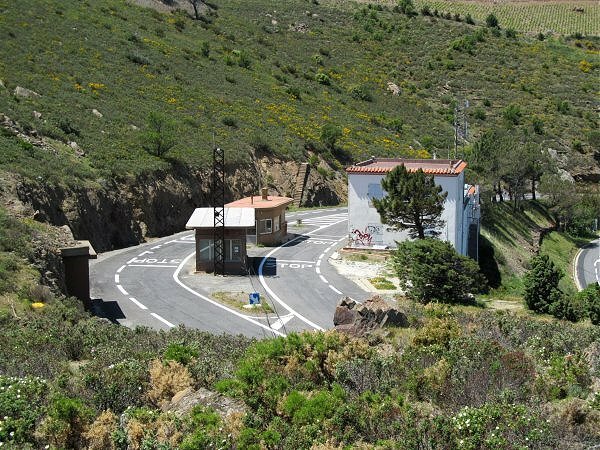 A guide then led Alma - cutching her bag containing the Bruckner manuscript - and the other four refugees along the steep path over the Albères hills into Spain to avoid the border patrols. After successfully crossing into Spain the Werfels travelled to Barcelona and on to Lisbon where they boarded a ship for America. They eventually settled in Hollywood where Franz Werfel wrote his novel The Song of Bernadette inspired by the material Alma had collected in Lourdes, and the subsequent film adaption was a huge box office hit. Franz Werfel did not convert to Catholicism, but The Song of Bernadette is considered a classic of Catholic literature. 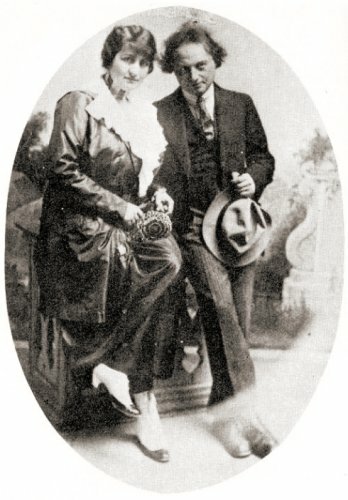 The Werfels are seen together in their Californian home in the photo below. Franz died in 1945 and Alma lived to 1964. At this point it would be easy to leave the Werfel's in comfortable exile in California. The story of their escape is moving, but it is one that any writer with a good research library and internet access could have told. When I finished my version of their story some time ago the narrative seemed too monochrome and, in common with so much online writing, lacked any real experiential substance. So I set the post aside until I was able to travel to Languedoc with my wife, to literally retrace Alma Mahler's footsteps. It seemed unlikely that the Österreichische Nationalbibliothek would let me take the now complete autograph score of Bruckner's Third Symphony - an impecunious Alma sold her manuscript to them in 1948 following Franz Werfel's death - in my daypack; so I compromised with a recording of the work on my iPod. 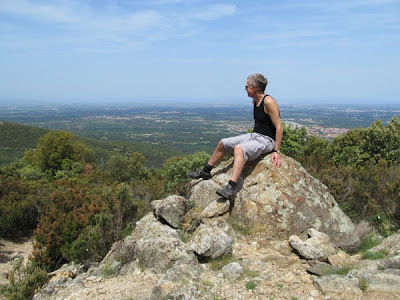 In fact I travelled to Languedoc twice because, as recounted here previously, my first trip ended in a peritonitis induced near-death experience - which just proves some music bloggers will do anything for a good story. But there were no such complications on my second visit, and our journey produced the photo journal below. So here, in colour rather than black and white, is a contemporary reconstruction of Alma Mahler and Franz Werfel's trek to freedom. 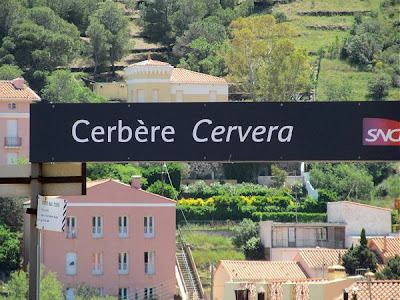 Above is the view of the town of Cerbère (Cervera in Catalan) that Alma and Franz would have seen when they arrived by train from Marseille. 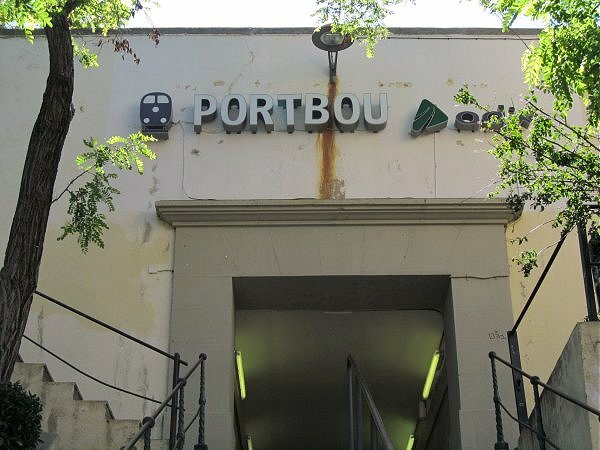 At the time Cerbère and Portbou on the Spanish side of the border were major transport hubs, with much of the cross-border traffic passing through them. But the decline of the railways and the building of the E15 motorway inland means they are now ghost towns. After climbing the hill this is the view that Alma and Franz would have seen looking back towards Cerbère station where the previous photo was taken. This is the border crossing between France and Spain that the refugees had to avoid - the checkpoint has been disused since the creation of the borderless Schengen area in 1995. As Alma and Franz did not have exit visas and the area was patrolled by Vichy sympathisers, the refugees had to avoid the check-point by taking the path over the hill above it, this is the view down to the border crossing. I try to avoid using photographs of myself, but this one is included to prove that I walk the walk as well as talking the talk. 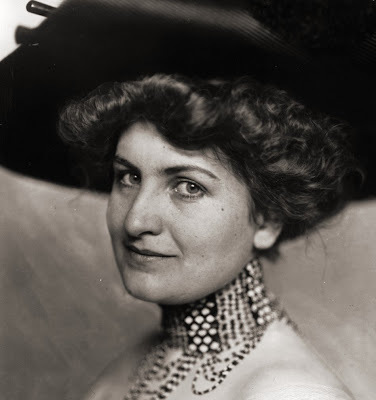 Alma Mahler was 61 when she walked the walk, which was two years younger than me. But I had the advantage over Alma of Gore-Tex walking boots instead of sandals! 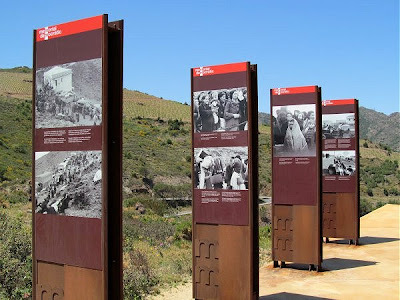 On the Spanish side of the border is this memorial to the Spanish Republican refugees who perished crossing the frontier in the opposite direction during the 1939 La retirada (retreat) from Franco's forces. Their story is told in Postcards from a forgotten concentration camp. In the background of this view of the Spanish frontier town of Portbou is the descent which Alma and Franz followed. My final photo below shows Portbou station where Alma and Franz took the train to Barcelona and on to fame and fortune in America. The Werfels trek across the Albères had a happy ending, as did mine at the second attempt. 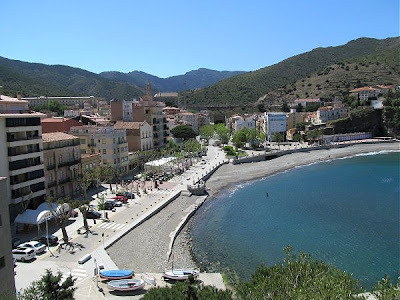 But others were less fortunate, and another post tells of how, just two months after the Werfels passed through Portbou to freedom, another refugee - the German-Jewish writer and philosopher Walter Benjamin - took his own life in the town. This post is dedicated with love to my wonderful wife whose speedy intervention in Languedoc meant that I survived to blog another day. Mad soul, she is currently packing our car for another trip to that magical region where the Albères hills reach the Mediterranean. À bientôt, j'espère! Photos 2 and 8 to 16 are (c) On An Overgrown Path 2013. Any other copyrighted material on these pages is included as "fair use", for the purpose of study, review or critical analysis only, and will be removed at the request of copyright owner(s). 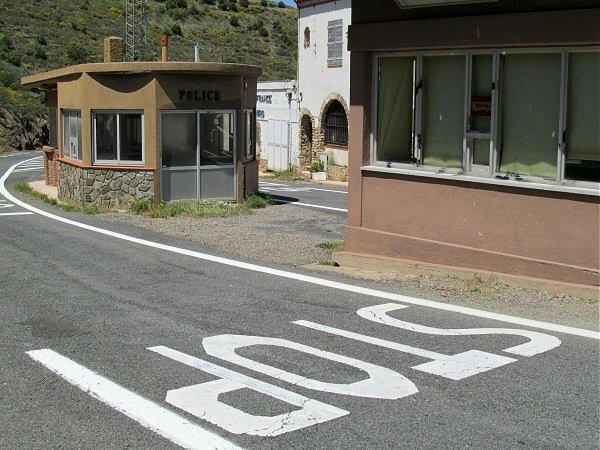 My trip to Languedoc was entirely self-fubded. Also on Facebook and Twitter. A fascinating article. Thank you and have a great trip. Is it possible to swim against the tide? Excellent piece ... thank you! I recall discovering Mahler at university (1965, I think). My first LP turned out to be an acclaimed one - the 4th with Cleveland/Szell/Raskin. Shortly after, I was charmed to discover via Tom Lehrer that Alma had died only a year or two previously. Interesting to recall the LP that introduced me to Mahler not too long after your enlightenment. It was Jascha Horenstein conducting the Fourth Symphony on EMI Classics for Pleasure - I still have the LP. I am VERY pleased to see the astonishing Varian Fry getting the attention he so richly deserves. I thank you for another splendid post and wish you well on your travels. Enjoy! Well, this path has another curve in it - I believe my introduction to Bruckner was an 8th on cassette with Horenstein. And my Szell Mahler 4th from 1965 still sounded terrific when I played it not that long ago. Jascha Horenstein was a very fine conductor who, undeservedly, has disappeared from view today. This is, presumably, because he did not record for a major label and, therefore, his back catalogue is not promoted. It is interesting to think about recordings that were an important part of your musical education. For me two series stand out - Colin Davis's Berlioz recordings with the LSO and Klaus Tennstedt's Mahler with the LPO. Even today, whenever I hear a new Mahler recording I find myself comparing it with Tennstedt and the new recording is rarely better. Re Jascha Horenstein, Bob, I do believe that Vox has reissued his recordings for that label, which means a considerable amount of Mahler and Bruckner, and varying quantities of Beethoven, Brahms, Mozart, Sibelius, Bach, Schoenberg, et al. Together with the BBCL releases and a sprinkling of others, it adds up to about 30 CDs, not including those on which he is accompanying (for Wild, Ogden, Gitlis, et al.). The quality is variable, but those who know the history of Vox would not be surprised at that -- his Mozart Requiem, for example, is hampered by both recording quality and by inconsistent singers. Nevertheless, there is some tremendous stuff to be found in his discography. It is a little late, but I should like to add one more comment re Horenstein. I won't do it, but this could be expressed as a quiz. I say that because I do suspect that some readers may be able to guess the author of these opening words of a review of Horenstein conducting Mahler's Ninth at the Proms, and also the Kindertotenlieder with Janet Baker. The quotation: "The more broadcast recordings of Horenstein's Mahler that come to light, the more obvious it becomes that the technical challenges that some of this music poses were simply beyond Horenstein's skills as a conductor." This is from David Hurwitz. Those most likely to have guessed that are those who have read his infamous denigration of Kathleen Ferrier -- "a minor local talent" -- as also of John Barbirolli, especially his Elgar and Mahler, and a pig-ignorant bash at Solomon's Tchaikovsky. This would not be of nearly so much consequence if he were not the Editor of Classicstoday.com, a widely read internet review site. He's also a write of liner notes, and his notes for Michael Gielen's Mahler set are another exercise in febrile self-indulgence. I suspect he has been invited to write liner notes because another of his pursuits is the writing of introductory books on various composer's music, including one on Mahler's symphonies. And worst of all, his prolific, prolix, and -- here I think is the key to Mr. Hurwitz -- narcissistic rants may well have made him the most often quoted reviewer on Amazon. There I come to the essence of this issue: the ludicrous influence of one slightly demented reviewer. Mozart, he has written, "...really does all sound the same." "Liszt is trash." And apparently he is relieved that only around two hundred of Bach's cantata's have survived. I recall that someone described Hurwitz as the Rush Limbaugh of writers on classical music, and I can't top that. Horenstein's late view of the Ninth -- the orchestra is the LSO -- is immensely significant, though very testing for the orchestra, the antithesis of Barbirolli and even more so of Bernstein, but equally valid and significant. However, I would bet that Hurwitz review, especially that opening sentence, has had a signficant effect on sales, and not just on that Horenstein recording. Thus the power of the internet. Thus the problem of ease of publishing in these days. Thus the problem of the current ignorance of classical record producers. It would be nice to be able to laugh at Hurwitz's twaddle, but it's consequences are too damaging. Thank you for this article -- really quite a fascinating tale of the times. I'm interested in Werfel's 1937 speech in Paris -- would you happen to have the source handy? I've looked for it, alas, to no avail.